I just want to make a post about this because there doesn’t seem to be any real good information about this on the internet. I tried looking for info and came up with NOTHING. So here it is. 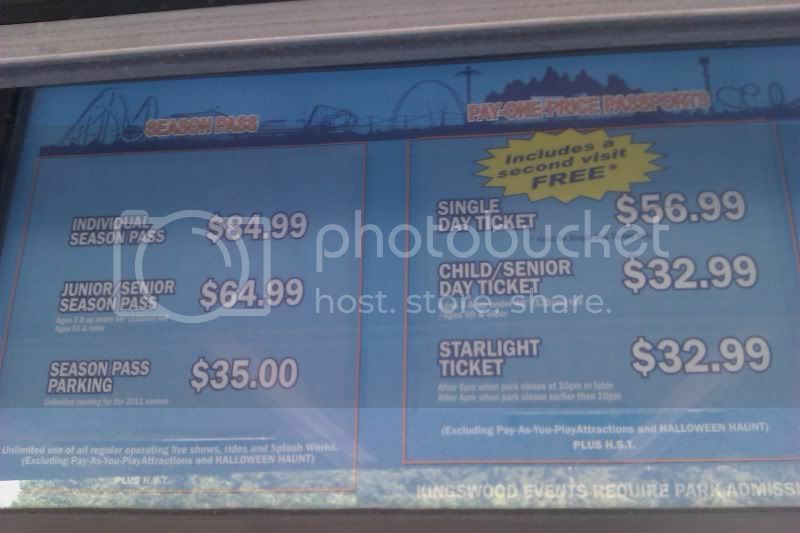 In 2011, these were the ticket prices for admission to Canada’s Wonderland, a Cedar Fair amusement park located in Vaughn, Ontario, which is about an hour north of Toronto. These are pictures taken from the tickets window when you arrive at the parks. If you can’t see the fine print under the Starlight ticket, it says that it’s valid for entry after 5pm on nights when the park closes at 10pm or later, and 4pm for nights when the park closes before 10pm. Be sure to check the calendar if this is what you’re interested in. A grounds admission ticket means that you won’t be going on ANY rides. You’ll be given a wristband to wear. You’ll still be allowed to watch the many shows that take place in the park. Parking is $12 for cars and vans, $15 for RVs and campers. Canada’s Wonderland itself offer deals on tickets on their website. There are discounts for buying your tickets in advance, especially if you only plan on visiting for a day. They also recommend hotels on their website. These hotels may offer packages and deals so it’s worth checking them out. Look for a location closest to you. East Side Mario’s now has a promotion for their new summer menu. If you buy a Coca Cola float, you can get a coupon for $12 off a one-day admission, as well as some coupons that include buy 1 get 1 free cotton candy. As a heads up for those that don’t have the time to scour Canada’s Wonderland’s website, outside food is NOT ALLOWED. Before you enter the park, your bag is searched for security reasons and if food is found in your bag, you will be asked to dispose or return them to your vehicle. Personal water bottles are allowed, but cans or juice boxes or any other pre-packaged drinks that are not bottled water are not allowed. Here is the page to that information as part of their food policy. To avoid paying for the food in the parks, pack a picnic if you have a car and leave the park in the middle of the day to enjoy your food outside the park. They have a picnic area outside the entrance for just this purpose. If you don’t want to pack a picnic and have a little more time, you can walk across the parking lot and towards a plaza. They have many places for you to eat there. It’s about a 5-8min walk. I really hope this information can help some people. If I were more tech savvy, I would probably make up a price comparison chart. Enjoy your visit to Canada’s Wonderland! For more information, please check their website at Canada’s Wonderland.com. This entry was posted in Everyday ramblings and tagged amusement park, canada, canada's wonderland, cedar fair, deal, discount, east side mario, macs, parking, starlight, ticket, tickets, Toronto, vaughn, wonderland. Bookmark the permalink. I’m so glad I was able to help someone! I had such a hard time finding information for myself, so I’m really glad you were able to find this! I’m so glad you’ll be able to save money. The new children’s area looks really cute! You can even take a picture with Snoopy. Just so you know, outside food is not allowed to be brought into the parks. Personal bottles are allowed, but not juice boxes. The cheapest meal I know of are the footlong hotdogs that are sold at the bottom of the mountain, across from Manchu Wok and Terriyaki Experience. The pizza in the children’s area usually has long lines and are really pricey. I was there a few weeks ago and we brought in a bunch of snacks (rice krispie squares, granola bars, etc…) which they didn’t say anything about when they checked our bags. When we went out for lunch and came back in we got in again with snacks. Maybe you got lucky, which is great! Sometimes they’re so busy they tend to “ignore” some of it. You can buy discounted tickets through Libro Financial Group as well as at Most Mac’s Milk stores. We just booked a Canada’s Wonderland hotel package at The Courtyard Marriott – Airport hotel. The cost of the 5 person room was $179.00 and that included 2 adult admissions. The regular cost of the room was $119.00 so a pretty good deal. Thanks for the tip, do you mind if I share this? Does the package include transportation to the park? It’s about a 20min drive from the hotel to the park. Are the Libro tickets available to the public? Just one more question, do you know how much of a discount you get at Libro? Or is this something I can find out on the website? They allow non-customers to just go in and buy tickets? Thanks for the info., I found your website while looking for info. on the cost of the grounds only admission pass for 2012, which I couldn’t find anywhere. I called them anyway and it’s $36.99. Which isn’t that much of a savings because if you buy your tickets online they are $39.99 so it’s not worth saving a few bucks and not be able to ride anything. Aw, great, they raised the prices? These were for 2011 prices, I should probably clarify that. Thanks for letting me know about the update! I’ll have to take another trip there to get the 2012 prices. That’s a great deal on their website! Hey Judy, thanks for your comment! I’ve never had to get a cab so I’m not sure, but I can check for you. I’ll email you back when I get the answer. The sad this is I was looking on the canadas wonderland web site for 1 hour an did not find what I was looking for. 5 min on this site found everything I needed. You’re very welcome! That’s why I made this blog. The website is so much more confusing than it used to be. I should make an updated post for this year. Great blog! I am going to Wonderland with a friend. Do you know a place where I could park a car for free all day? I want to save on parking, so we only have to pay for 1 car at wonderland and leave the other car safe,but free. There IS parking at the plaza across the street from Wonderland, but that one has a strict rule of patrons only. I’m sure you don’t want to risk your car getting towed. Unfortunately, you won’t be able to find any free parking. You CAN however pre-buy your parking pass on the Canada’s Wonderland website. 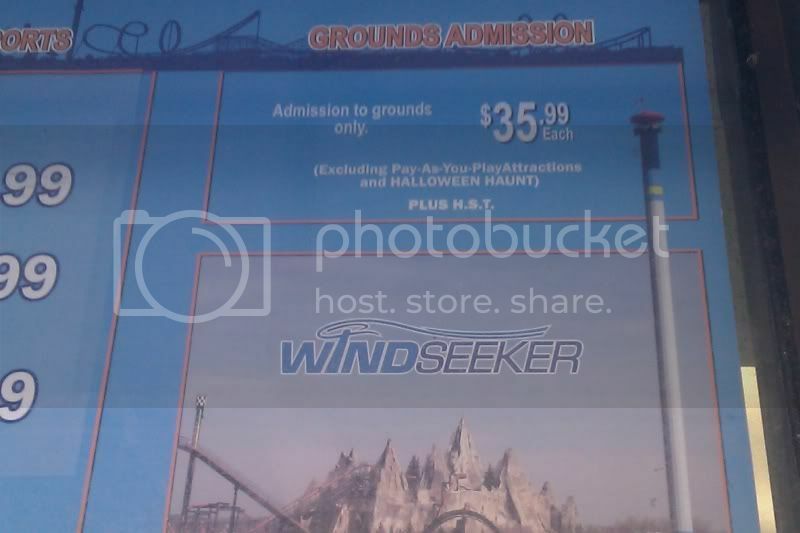 Here’s the link http://www.canadaswonderland.com/tickets/ It’s a couple of dollars cheaper. Where are you coming from? There a lot of parking lots around Toronto’s TTC stations that have free parking on the weekends. I’m glad you liked my blog! I really need to update this post especially.